Welcome to Southern Colorado Attractions where there is something for everyone! First, I want you to imagine standing in your hotel lobby looking at all the brochures and fliers as you try to decide where to spend your day and where everything is located. Wouldn’t it be much simpler to take advice from someone who has already done it so you don't waste your time at "dud" places? Well that is what you will find here. We have been to all of these places many times and in all kinds of weather. We will tell you where each major Colorado attraction is located, entrance cost (if there is one) and the best time to visit. As well as any other fun facts or information we feel will benefit you! This allows you to easily consider all of your possibilities with little hassle so you can spend more time enjoying your vacation! So let your adventures begin. . . Ever imagined building a sand castle while looking up at snow? Well it can be done at the tallest sand dunes in North America. 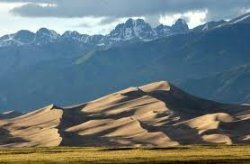 I love the Great Sand Dunes National Park as you can climb the highest dune, over 750 feet, play in the creek, sled the sand slopes, or just admire the beauty. 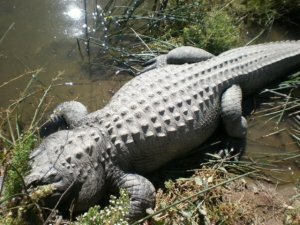 Want to hold a baby alligator or perhaps wrestle a large adult alligator? 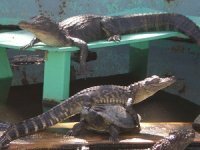 At the Colorado Gators attraction they have over 300 alligators, giant pythons, tortoises, and much more. You can even meet Morris the movie star which is the alligator from Happy Gilmore! This is a must do for all swimmers and hot tub lovers! The Sand Dunes Swimming Pool is an outdoor, naturally hot artesian swimming pool that is kept between 98-100 degrees Fahrenheit year round. There is also a therapy pool that is kept around 105 degrees Fahrenheit. With amazing views of the Great Sand Dunes and Sangre de Cristo Mountain Range it is an amazing Colorado attraction for any time of the year. Twice a year over 20,000 Sandhill Cranes migrate through the San Luis Valley, stopping only for a few weeks making this a seasonal attraction. 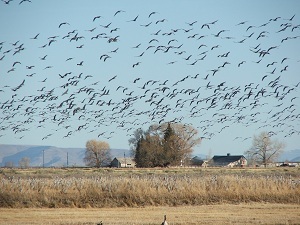 Sandhill Cranes can be found on the Monte Vista Wildlife Refuge as well as farmers fields as they eat the excess grain. The Monte Vista Crane Festival takes place during mid-March which is the peak of the spring migration. The Ski Hi Stampede (pronounced sky) is Colorado's Oldest Pro Rodeo and it takes place every year in Monte Vista during the last weekend of July. There are four days of activities which include a concert, parades, rodeos, and dances. Country music artists such as Blake Shelton, Clay Walker, and Sawyer Brown have performed in past years. Travis Tritt will be performing in 2011! During the first week of August the 4-H fair takes place at the Ski Hi Stampede grounds. Kids from across the San Luis Valley bring their projects to compete. The projects vary from photography, wood working, and cooking, to outside with the farm animals. There are showmanship classes during the week for all the animals and the fair is wrapped up with the livestock auction. An amazing Colorado Attraction is Wolf Creek Ski Area. 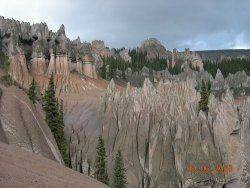 It is located on the far west side of the San Luis Valley at the top of Wolf Creek Pass. This ski area usually receives the most snow in Colorado! It is one of the smaller ski areas in Colorado but does not lack any charm. There is terrain for all levels of ski and snowboards. I enjoy this ski area as the lines are usually short and that means more time on the slopes! 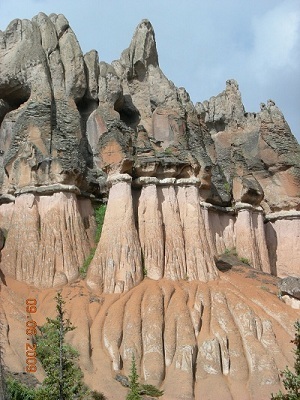 With spires rising high into the sky Wheeler Geological Area is an amazing site. Covering 640 acres this ghostly landscape offers a unique look at the power of erosion while displaying awing beauty. It is a beautiful drive or hike to see Wheeler which will make your trip to Southern Colorado complete! During the summer months a Southern Colorado attraction you don't want to miss is hiking to the Orient Mine. 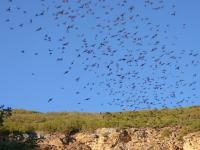 Over 250,000 Brazilian Free-Tailed Bats call this old abandoned mine home and leave the safety of it at dusk in search for food. It is an amazing site to watch all of these bats leaving the cave. Ever thought you have seen a UFO or alien? Well, there have been many sightings in the San Luis Valley. 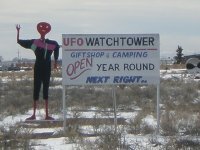 So much so that a UFO Watch Tower was created. Not sure if you believe in UFO’s or not? Stop by the tower and see for yourself at this one of kind Colorado attraction. Located south of the Great Sand Dunes, Zapata Falls is an easy half mile hike to a beautiful waterfall. The hike can be made in the summer or winter. In the summer you must wade through the water to see the waterfall. In the winter the waterfall is completely frozen and a pretty blue color. It is a great way to cool down after a day at the sand dunes. Located in the oldest town in Colorado, San Luis, Stations of the Cross depicts the last hours of Christ’s life. Statues depict Christ’s judgment, suffering, death, and resurrection. A trip to the Stations of the Cross is a very moving experience and I would highly recommend it to everyone. It is truly a Colorado Attraction you don't want to miss! The Oldest Church in Colorado was founded in 1858 and it is still in use today. It is located at the southern end of the San Luis Valley near Antonio, Colorado. The Alamosa, Monte Vista, and Baca Grande Wildlife Refuges are all amazing places to watch for wildlife. Every year thousands of birds stop at the refuges during their migration. Other animals from beavers to coyotes to elk can be seen on the refuges. The Monte Vista refuge is a major stopping point for the Sandhill Cranes. No matter what time of year there is always something to see at these Southern Colorado Attractions! 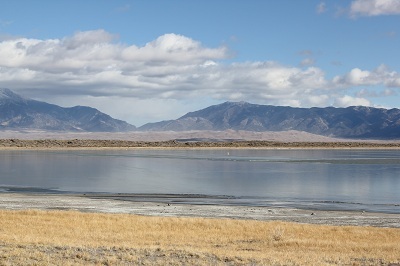 San Luis State Park or San Luis Lakes is the only lake in the San Luis Valley that boats can use. It offers great picnic sites complete with a covered picnic table and fire pit as well as overnight camping. San Luis State Park also has some of the best views of the Great Sand Dunes National Park and surrounding mountains. Stop by here after a fun day at the Great Sand Dunes and enjoy the views!